This tasty salad is simplicity itself. But what takes it over the top, flavour-wise, is the homemade bacon vinaigrette—served warm for extra elegance. 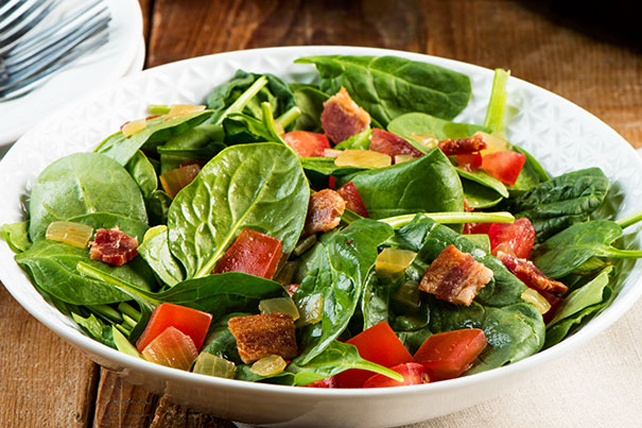 Toss spinach with tomatoes in large serving bowl. Cook and stir bacon and onions in large skillet on medium heat until bacon is crisp; drain. Discard drippings from skillet. Return bacon mixture to skillet. Add vinegar, water, sugar and pepper; mix well. Cook 3 min. or until heated through, stirring frequently. Substitute leaf lettuce for the spinach.